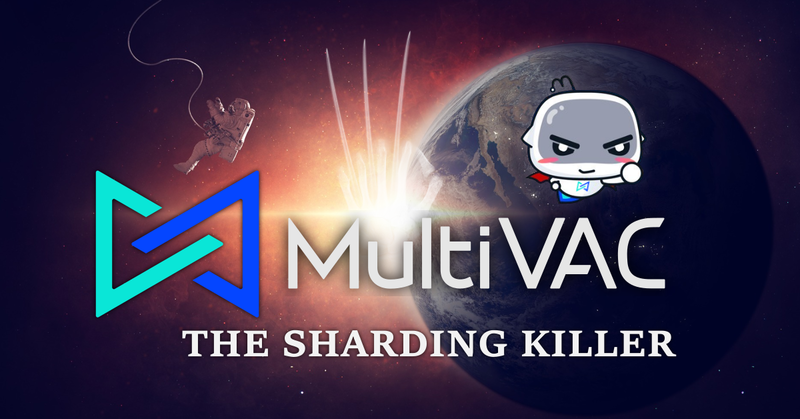 Why MultiVAC is called Sharding Killer? To begin with, sharding is like making subsets of the network called shards that distributes load yet parrallelizes network processing. So instead of like batch processing, it is a simultaneous processing on each shard. This process has already been proven effective on scaling traditional databases, making load easier and queries faster. In the blockchain world, the word sharding is now a term that directly implies scalability — the missing piece in order for blockchain platforms attain mass adoption, that is to support commercial level applications like that of Google, VisaNet or Facebook. Compromise on Security and decentralization is said to be unavoided in able to attain industrial level scalability. However, MultiVAC Team has something else in mind that is going to change that. With their novel sharding approach, scalability is achieved without compromising on Security and Decentralization. Unlike Bitcoin and Ethereum where transaction per second has limit even there are more hashing power available, MultiVAC enables infinite expansion wherein the network also speed up as more nodes join the network. How does it compare with other high throughput blockchain solutions? For example, EOS can also achieve industrial capacity using DPOS(Delegated Proof of Stake). However, there are only 21 block producers (nodes) responsible to run the network. With this kind of protocol, though still decentralized, a good governance is always necessary. That is why there is a need for an Institution where EOS holders vote. Wherein in MultiVAC, preventing attacks on the network is dependent to the design architecture itself not on decisions made by people running it. For off-chain scaling solutions like lightning Network and Plasma, they diminish the function of public blockchain to make data verifiable for everybody, which creates insecurity on what could happen while off-chain. Also, though time, miners may loose interest as more off chain transactions are processed than on the blockchain itself, losing the central use of the blockchain entirely. How about with Zilliqa, Quarkchain and alikes? Compared to existing Blockchain projects that uses sharding, MultiVAC is the first to realize that sharding can also be applied in storage and transmission as well. The idea is because nodes do not only compute but also store and transmit data. So sharding can be applied on the three to achieve a flexible scalable solution. MultiVAC uses a Proof of Stake System, where miners provide consensus. “Proof of stake but there are miners?”. Yes, this is to prevent 51% attacks, because miners stake some tokens to join consensus, thus more hashing power doesn’t mean more control of the network. Also, it allows even CPU computers to participate in mining and more specifically designed for them. In MultiVAC, miners does not store blockchain transactions on their computers. This allows even ordinary desktop computer to participate, making it open to mini players, thus making it more decentralized. It is because there are storage nodes that store all the transaction data. Storage nodes have higher hardware requirements, and are also incentivised for storing data. They have no decision making participation on consensus, so centralization does not pose risk of them controlling the network. Other platforms that uses this technique are distributed cloud storage platforms, MultiVAC is the first DApp Platform coupled with sharding to use this, thus removing the burden of downloading the blockchain transactions to miners. MultiVAC also considers designing a way to rightfully incentivise nodes for transmitting data, a part usually overlooked by other distributed storage systems. MultiVAC uses Verifiable Random Functions (VRF) to assign nodes on each shard, making grouping random and also unpredictable. UXTO model and Byzantine Consensus algorithm is used to reach inshard consensus. VRF is also applied on it’s dynamic sharding, a mechanism where nodes are resharded every few minutes. MultiVAC uses PoIE algorightm to verify correctness of smart contract execution same to that of Ethhash that discourages ASIC mining. These algorithms used by MultiVAC, make attacks unlikely to be successful. Even an attack was launch and the node is rewarded, the computations will still be right, keeping the network still functioning well. Another notable in MultiVAC design is it performs sharding independent for transactions and for smart contracts execution. This feature also makes MultiVAC to be the first blockchain platform to allow DApps to set their own parameters. They can optimized the balance they prefer on Scalability, Security and Decentralization (how many nodes do they need). Aside from their novel sharding solution, MultiVAC also caters most high level programming language, making it open to more developers. This is made possible by providing a general-purpose virtual machine called MultiVAC Virtual Machine (MVM) equipped with a specially designed blockchain instruction set (BISC). MVM can execute complex computations making it business ready. In MultiVAC, There is gas fees in executing smart contracts, this is to encourage developers to make their code optimized as possible. Thus preventing unnecessary burden on smart contract computations. If you check-out their all star team at their website: mtv.ac, you will notice team members as “Algorithm Researchers”, a job title not commonly seen on other blockchain projects. We can know from here that significant bugs on the network will be unlikely. Aside from many R & D Engineers have experiences from Google, Facebook, Tencent, Alibaba and the likes, MultiVAC have academic advisors and significant team members are also professors, making the project peer reviewed before it will be released on public. If the team will stick on their promises as stated on the Technical Whitepaper and Sharding Yellowpaper, MultiVAC, A.K.A. Sharding Killer will soon to be the go-to for Decentralized Applications ready for mass adoption.